You never know what fun stuff we’ll find next, so stay tuned! Wolven Threads is a surf, swim and yogawear brand based out of California. The adorable and reversible (!!) Stratus Crop Top and matching Stratus Crop Leggings are made from recycled plastic waterbottles. They’re sweat-wicking, quick-drying, antimicrobial, super comfy and oh-so fashionable. Use code: “SpringintoWolven” for 20% off! Shop this awesome yoga and activewear line here. Yoloha makes cork yoga products, and their cork yoga mats are their most popular and beloved items. 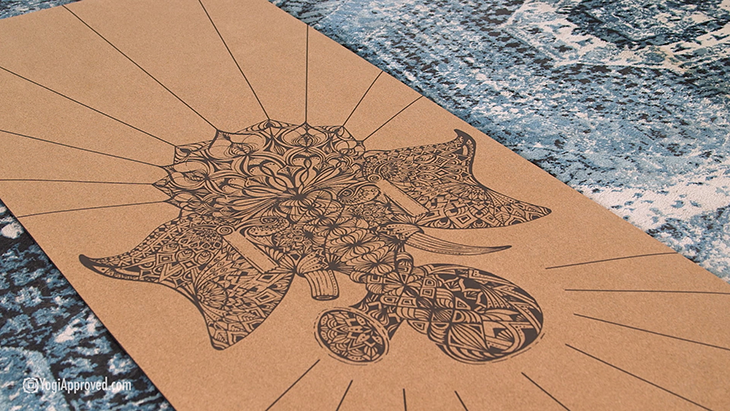 The Ganesha Aura Cork Yoga Mat has a beautiful image of Ganesha, said to be the remover of obstacles. This cork mat is super lightweight (weighing less than 3 pounds) and has great grip and extra thick cushioning (ideal for sensitive joints and a restorative yoga practice). It’s made of all-natural, eco-friendly and chemical-free materials. Shop your new favorite yoga mat here. 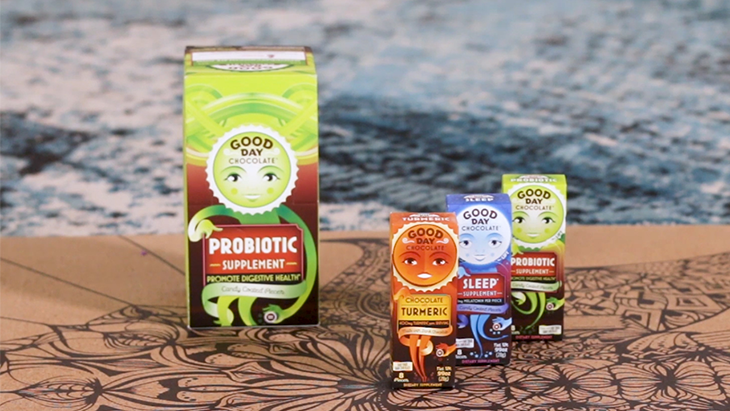 Vitamins and supplements are such an important part of our wellness regimen, and now you can get them in chocolate form thanks to Good Day Chocolate! Find chocolates based on your needs, from Sleep to Calm, Energy to Vitamin D – there’s an entire line to choose from! The featured Probiotic contains 1 billion CFUs per piece. All chocolates are fair trade with natural, non-GMO ingredients and are colored with fruits and veggies. Get your very own chocolate probiotic supplements here or at select health food stores. Wai Lana is a yoga and wellness brand with a wide range of yoga products. The Towel Strap is a brilliant combination of yoga towel and yoga strap in one is perfect for a hot yoga practice, or anyone who sweats during yoga and uses a strap. It’s made out of a super absorbent microfiber material and has custom hand loops for easy grip. Check out Wai Lana’s entire product line here. 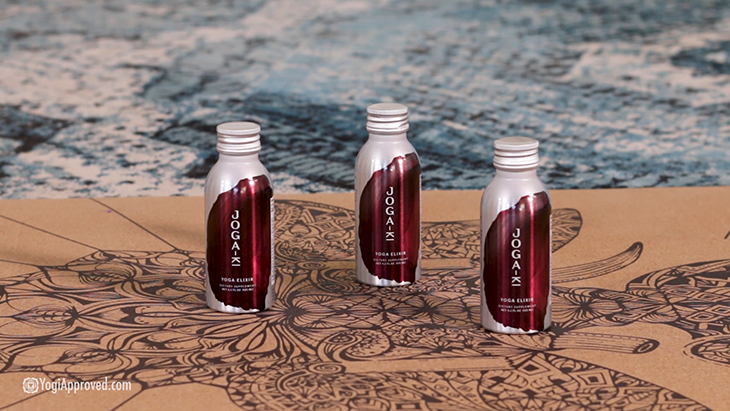 Joga-Ki is a plant-based whole food supplement made for specifically for yogis! With watermelon, red and green spinach, beet root and mamaki, this little elixir packs a big punch of antioxidants, potassium, electrolytes, and Vitamin C. Meant to be taken as a pre-yoga supplement, Joga-Ki supports blood cell function and cardiovascular health so you can get the most out of your time on the mat. Shop Joga-Ki yoga elixir at joga-ki.com. Spring is here and new fashion trends for yoga are blooming! Here’s the scoop on Spring fashion in yoga for 2018 from your favorite yoga brands.